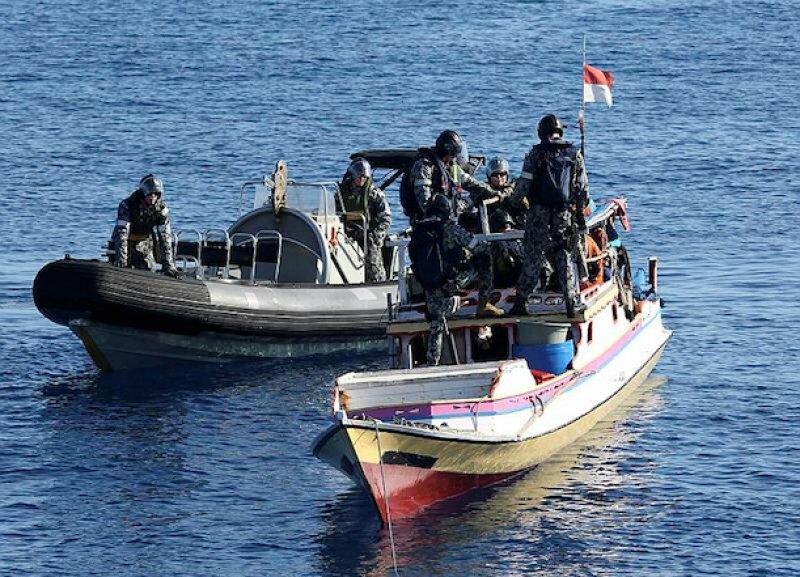 Jakarta (AsiaNews) - The Indonesian navy sunk today three Vietnamese fishing boats, recently caught off Natuna, near the Anambas Islands, Riau Province, north of Sumatra. President Joko "Jokowi" Widodo gave the order to sink the boats after removing the crews as part of a campaign to protect Indonesia's maritime resources, plundered by foreign trawlers and other boats. Former President Susilo Bambang Yudhoyono usually left foreign fishing boats ply domestic waters, unchecked for illegal fishing. Jokowi instead reiterated Fisheries Minister Susi Pudjiastuti's statement last month that Indonesia would start sinking illegal fishing boats caught in Indonesian waters. The president wants to protect the country's domestic fishing industry, whose vessels use more traditional and less invasive fishing methods. In doing so, he also wants to restore the glory of Indonesia's naval past by injecting greater nationalism and patriotism. "The message is clear: do not trespass our waters without the necessary permits," said Minister for Political, Legal and Security Affairs Tedjo Edhi Purdijatno. "The order was issued by the president and we will take the action," said Navy spokesman First Admiral Manahan Simorangkir. By ordering to "shoot and sink", Jokowi wants to defend Indonesia's economy and fishing industry. He has made it clear that before boats are sunk everyone on board has to be rescued first. Although Jokowi has complained that illegal fishing by foreign trawlers in Indonesian waters represents billions of dollars in lost revenue, his hard-line stance has meet with opposition both at home and abroad. Recently, Muslim extremists have attacked Fisheries Minister Susi Pudjiastuti, who had announced the measure, accusing her of incompetence and dereliction of duty at the Fisheries Department. Neighbouring countries have also protested against Jakarta's action. They include Malaysia, Thailand, Vietnam and the Philippines, whose boats have fished illegally and without checks inside Indonesian territorial waters. Malaysia is especially adamant in its protest. Kuala Lumpur accuses President Jokowi of reviving Indonesian nationalism against neighbours, as it did in the 1960s under its first president Sukarno.